As you begin to read this blog, you may be wondering a little bit about how I got interested in this field. 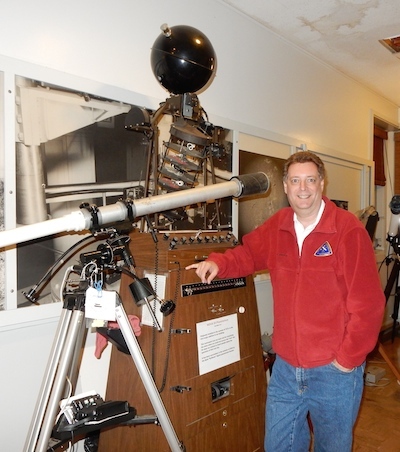 A friend recently took this photograph of me for the Delaware Astronomical Society (DAS) member pages and I realized that it really is a good photograph to describe my journey. My arm is resting upon a Spitz planetarium projector. This instrument from the 1950s was one of the early projectors they used to display a set number of stars and the planets onto a domed ceiling. In fact, in college where I took an elective in Astronomy, Spitz projector with serial number less than 5 was installed in that planetarium when it first opened. So the project represents my introduction to Astronomy in college. After letting it languish for other interests, in the late fall of 2014 we had a wonderfully clear, cold night. Upon returning home from some event, I was fascinated by the number of stars I could see. The longer I gazed upon the night sky, the more stars became visible to my night-adapting eyes. I went inside for my binoculars and gazed at the one cluster of stars, the Pleiades, that I recognized. The number of stars in the seven sisters popped with even more stars visible through the lenses of the binoculars. I decided that night that I should make an effort to start to learn the heavens so that at night it would become a friend and I would be able to navigate my way around the night sky with some universal (pun intended) landmarks. I decided to find some star charts and start by learning the sky. But that’s now what ended up happening. The short version of the resurgence of interest is that I saw and ended up successfully bidding on a small refractor telescope at a local auction that I tried to fix up and use. It turned out to be pretty much junk, but I was able to view the moon through it. And that led to an interest in obtaining a better telescope. After doing much internet reading (particularly on Cloudy Nights), I decided that if I was still interested in this in the Spring, I would purchase a better telescope. However, over the Christmas holidays I happened to find on Craigslist not one but two telescopes on tripods along with accessories at a low price. So before January 2015 had come and gone I was the owner of not one, but two telescopes! Some good educational materials to learn about the night sky. I’m excited about the journey and hope you will enjoy reading about my education in this area of science.